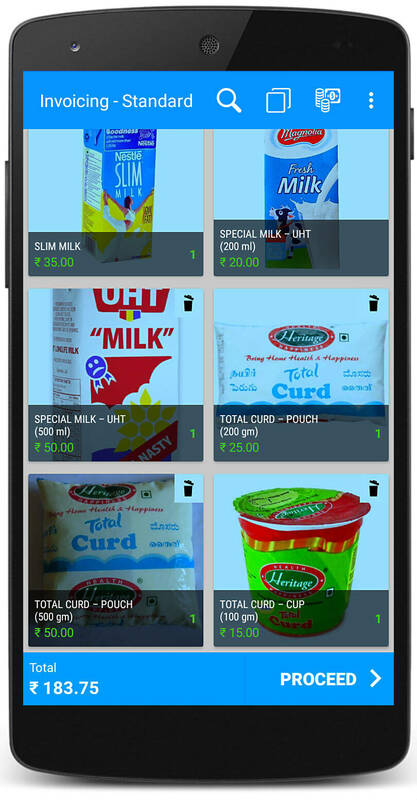 Dairy Software for dairy products and milk shops that makes it easy for your shop to maintain its Billing, Inventory, Customers and accounting. Dairy products are items people use regularly like everyday in their life. But the life of most of the products is just a few days. So, its important to the owner to know exactly how many products required for a particular day or for a couple of days. Even noting down suppliers details are crucial because inventory order placing happens almost all days. Just billing dairy software can manage all your business activities in a very smooth way. It keeps proper recording about sales, customers, suppliers, inventory etc. Accounting process and tax calculations become easy with zero errors. As most of the products get sold on an everyday basis. Just billing can produce day to day sales reports, which can help you to know what are the products getting sold more. Just billing is very easy to configure and use. For app, you can go to playstore and download directly. For windows, you can do from our website. All you need to give is a few basic information about the business during setup. As many people are familiar with their mother tongue and may not know English well, software gives you the option to change the language according to your wish. All you need to do is go to language settings and select your local language. Giving different payment mode options is actually an advantage to the business owner. It gives choices to the customer in which they want to pay. As nowadays lot of payments gateways giving some additional benefits for using their service. Planning inventory is one of the important tasks in the business because usually most of the sales happen in the early day time. So always need to have an estimation of how many products we required on regular basis. Just billing gives you real-time inventory update and you can easily know how many products you need to place the order. Dairy products business will have a lot of regular customers. For few, we may home deliver daily. So its very important to note down their information, so that billing and delivery will be more quick than usual. This feature helps a lot when customers want to pay monthly basis. The software can you give the total amount of particular month a customer needs to pay in just click. As most of the products will expire soon. You need to have control over your inventory or else you can face losses in name of wastage. Just billing provides different reports which help you to forecast the required inventory to place order. This can help you to cut down maximum wastage. There are products GST applicable to different rates and also products without GST. Just Billing dairy software can calculate the GST automatically according to the rules and regulations of your respective country/state during the billing process. Download and follow simple steps to setup Just Billing dairy software.